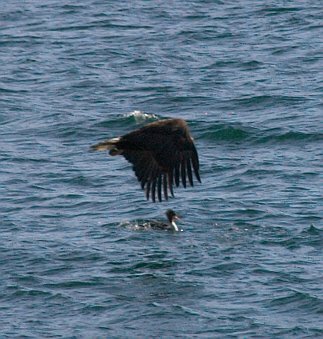 It appears here that the eagle has a chance at the mother, but I think she went under water before the eagle make a grab. In the end, the mother's efforts to get her young to dive down appeared to be successful. After a few minutes, the eagles seemed to lose interest and the mergansers were able to continue across the bay.